To say this wine is intriguing would be an understatement. 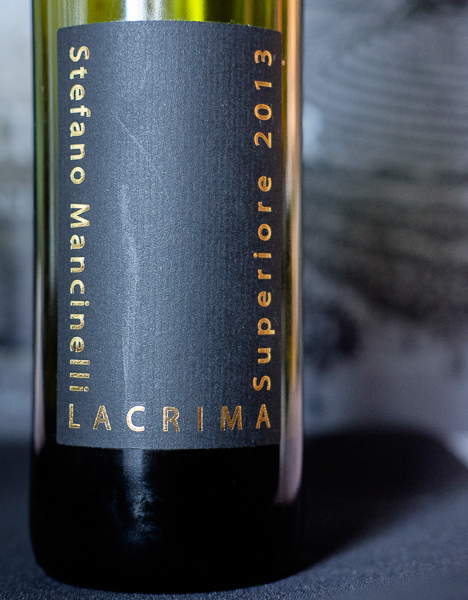 Producer, Stefano Mancinelli is widely acknowledged as one of the best producers of Lacrima di Morro d’Alba wines. Made from the Lacrima grape, I had to search hard for information about it. This is one of literally thousands of native Italian varieties that are now being nursed back by winemakers and growers eager to literally return to their roots. There are only about 200ha planted in total and Mancinelli has about 24 of those. Of course, lacrima is Italian for tear. So, there are more than a few hypotheses about the name of the wine and the grape – including that it is tear-shaped and has extremely delicate skin which breaks easily (and as it bleeds, it’s said to ‘cry’). Others claim it makes such incredibly fragrant wine that it will make one tear up. Mancinelli has planted his vineyards in Ancona about 10km from the Adriatic coastline (go to Siena and travel due east to the coast). I know, you’re thinking as I had initially – Alba equals Piedmont where Barolo is produced. Nope, it’s located on the east coast in Ancona. His winery boasts an olive oil mill (from 1500 trees) and a distillery producing Grappa di Lacrima and Grappa di Verdicchio. If this doesn’t sound perfect enough, the family also has a B&B overlooking the vines. Upon decanting, this wine opened up its substantial aromas and flavours. On the eyes, it’s a medium ruby with full on persistent and fragrant aromas of gardenia, lavender, satsuma, bright red cranberry and baking spices. I know, right!? It’s a head turner. The palate is dry with high acidity and lightly grippy tannins. Flavours are extremely floral with berry, black cherry, dried pine and orange-chocolate, cinnamon and nutmeg. The brief finish is the only disappointment on this chameleon. Mancinelli has aged this in a little wood, but mostly in stainless steel for 12 months prior to bottling and then an additional 3 months prior to sale. WSET Good plus – the light finish detracts from the initial punch and intrigue. A challenge to match with food, it would augment either creamy sauces and pasta, or boldly flavoured meat dishes. This entry was posted in Italy, Lacrima, OTHER, RED and tagged Ancona, italia, Italy, Lacrima di Morro d'Alba DOC, Lacrima grape, Morro d'Alba, red wine, Stefano Mancinelli, Superiore. Bookmark the permalink.